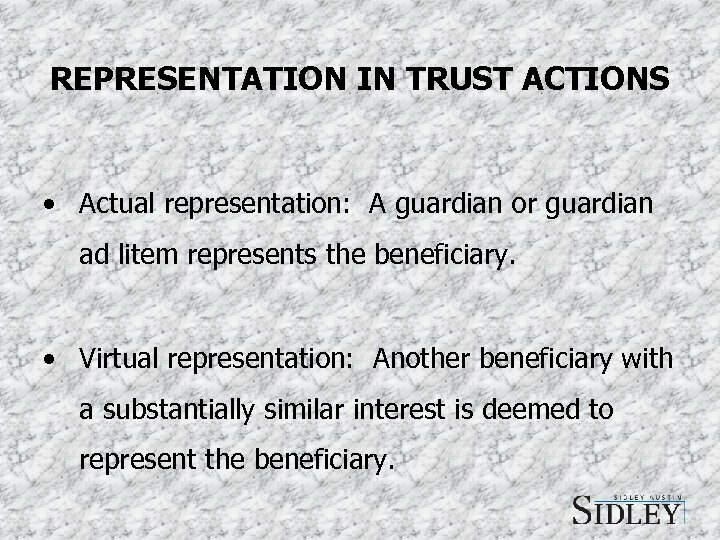 REPRESENTATION IN TRUST ACTIONS • Actual representation: A guardian or guardian ad litem represents the beneficiary. 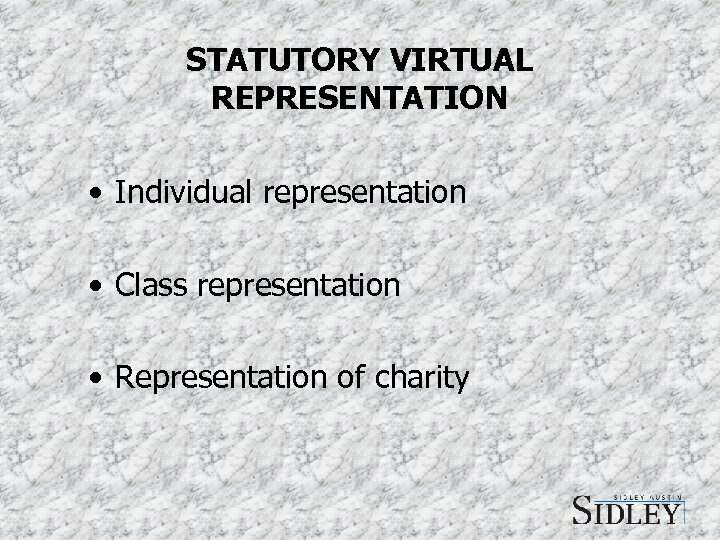 • Virtual representation: Another beneficiary with a substantially similar interest is deemed to represent the beneficiary. 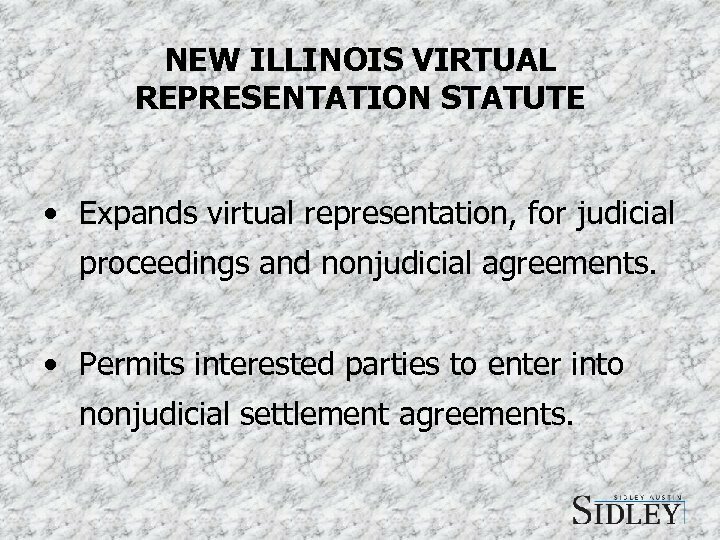 NEW ILLINOIS VIRTUAL REPRESENTATION STATUTE • Expands virtual representation, for judicial proceedings and nonjudicial agreements. • Permits interested parties to enter into nonjudicial settlement agreements. 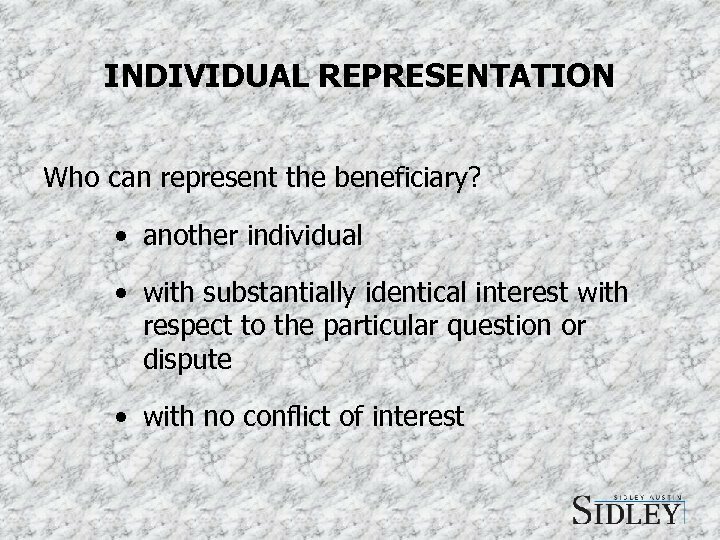 INDIVIDUAL REPRESENTATION 760 ILCS 5/16. 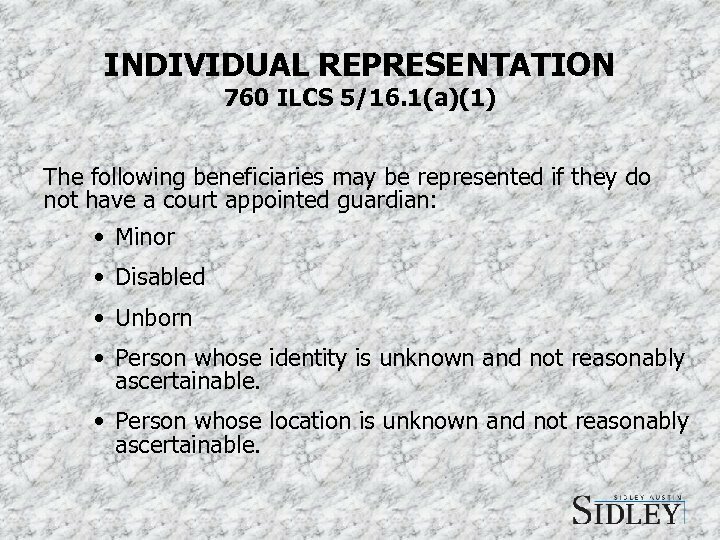 1(a)(1) The following beneficiaries may be represented if they do not have a court appointed guardian: • Minor • Disabled • Unborn • Person whose identity is unknown and not reasonably ascertainable. • Person whose location is unknown and not reasonably ascertainable. CLASS REPRESENTATION 760 ILCS 5/16. 1 • Primary beneficiaries can represent certain future primary beneficiaries. 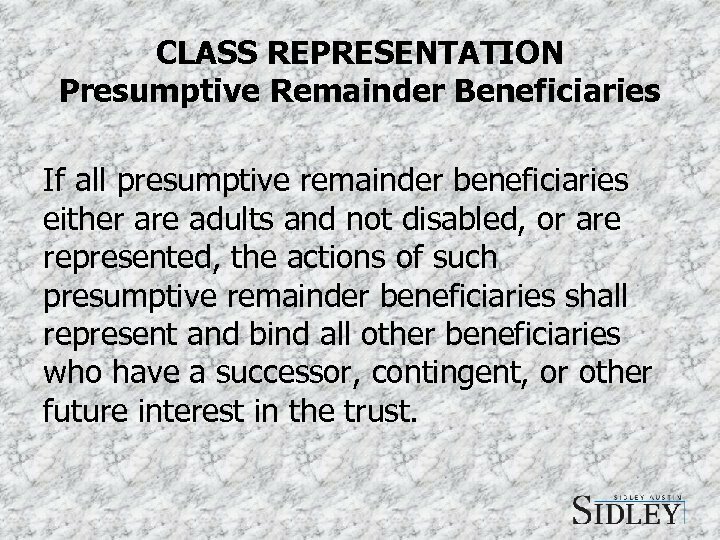 • Presumptive remainder beneficiaries can represent beneficiaries with successor, contingent or future interests. 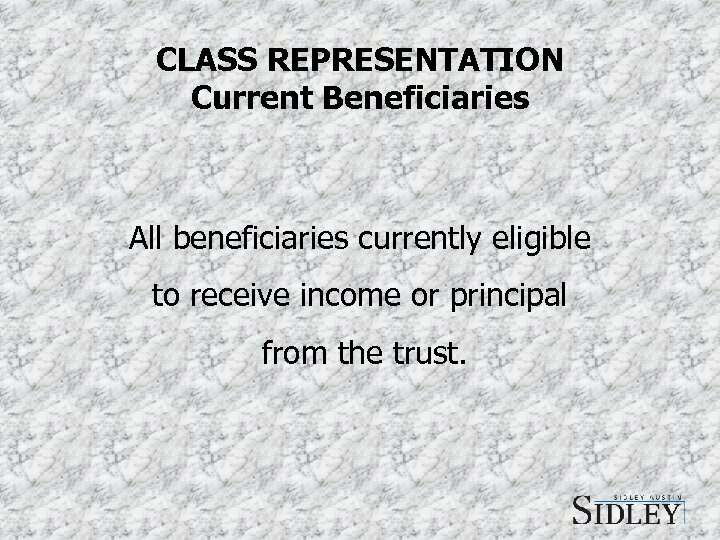 CLASS REPRESENTATION Current Beneficiaries All beneficiaries currently eligible to receive income or principal from the trust. 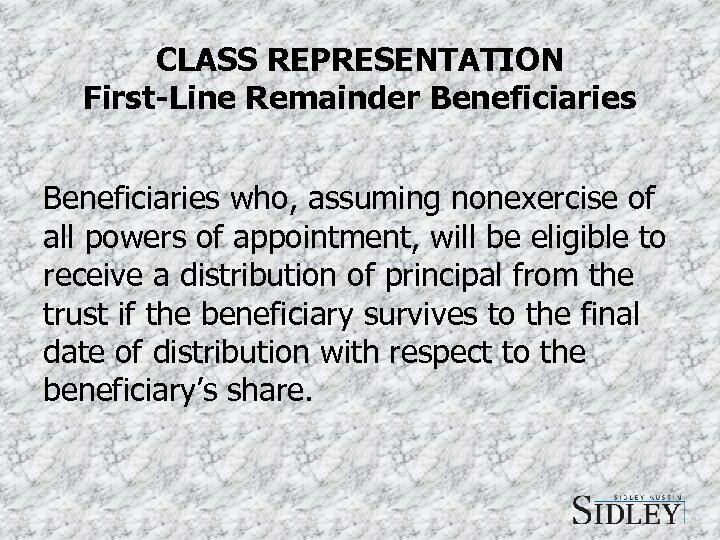 CLASS REPRESENTATION First-Line Remainder Beneficiaries who, assuming nonexercise of all powers of appointment, will be eligible to receive a distribution of principal from the trust if the beneficiary survives to the final date of distribution with respect to the beneficiary’s share. 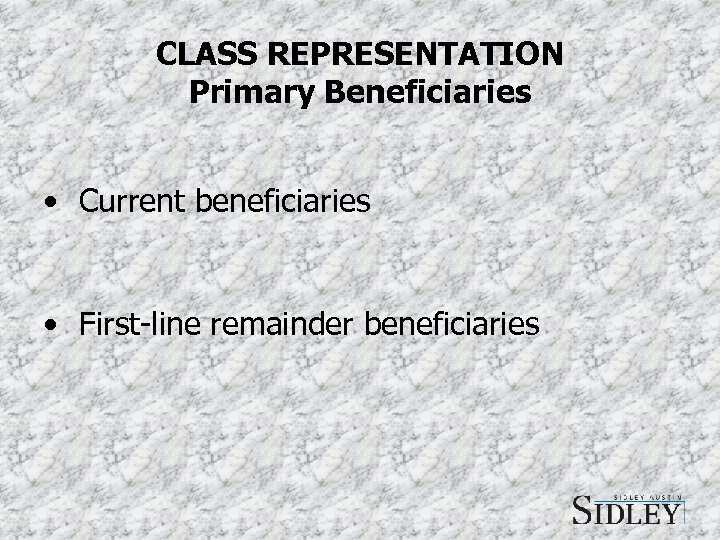 CLASS REPRESENTATION Primary Beneficiaries (continued) Examples: • Income to A for life, then principal to B. A is a current beneficiary and therefore a primary beneficiary. B is a first-line remainder beneficiary and therefore a primary beneficiary. • Income to A for life, then to such of A’s descendants as A shall appoint in A’s Will, and in default of appointment to B. B is still a primary beneficiary. The potential appointees are not. 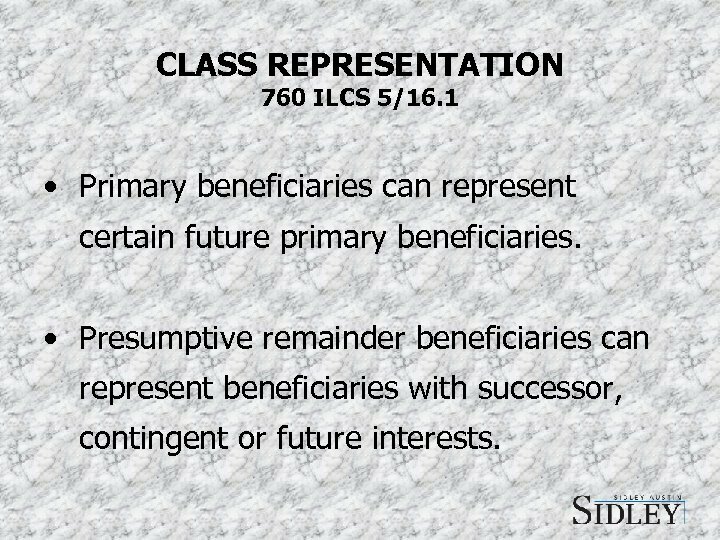 CLASS REPRESENTATION Primary Beneficiaries 760 ILCS § 16. 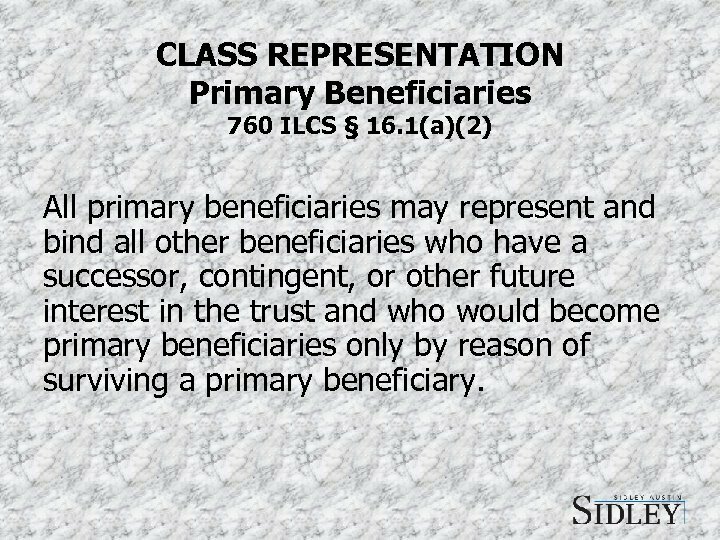 1(a)(2) All primary beneficiaries may represent and bind all other beneficiaries who have a successor, contingent, or other future interest in the trust and who would become primary beneficiaries only by reason of surviving a primary beneficiary. 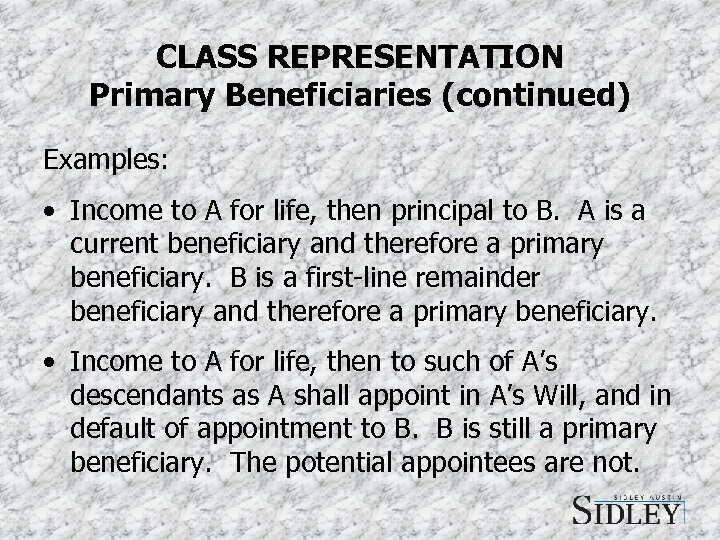 CLASS REPRESENTATION Primary Beneficiaries Example: Income to A for life, then remainder to B, or if B is not living, to B’s descendants. • A and B are primary beneficiaries. 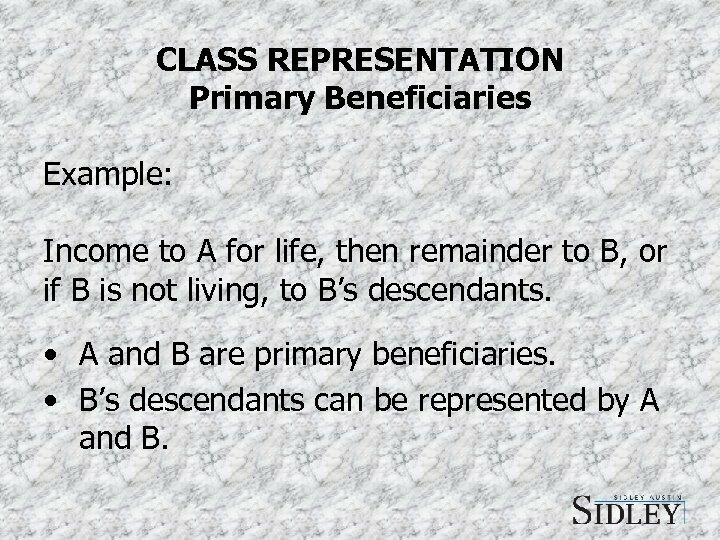 • B’s descendants can be represented by A and B. 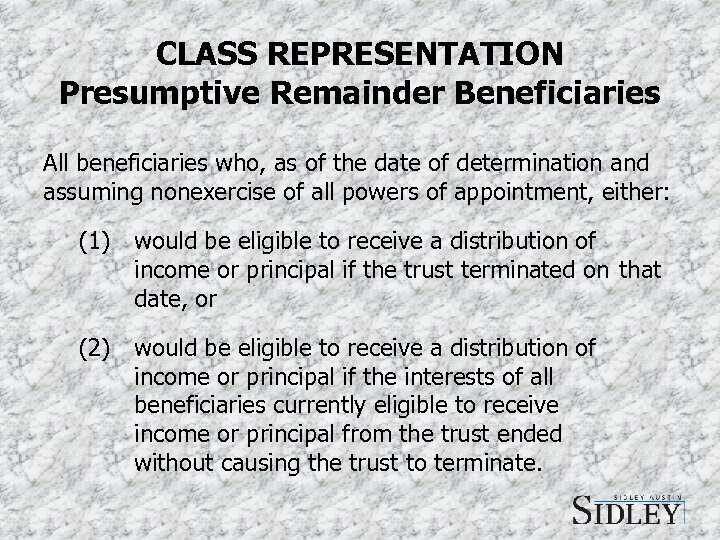 CLASS REPRESENTATION Presumptive Remainder Beneficiaries All beneficiaries who, as of the date of determination and assuming nonexercise of all powers of appointment, either: (1) would be eligible to receive a distribution of income or principal if the trust terminated on that date, or (2) would be eligible to receive a distribution of income or principal if the interests of all beneficiaries currently eligible to receive income or principal from the trust ended without causing the trust to terminate. 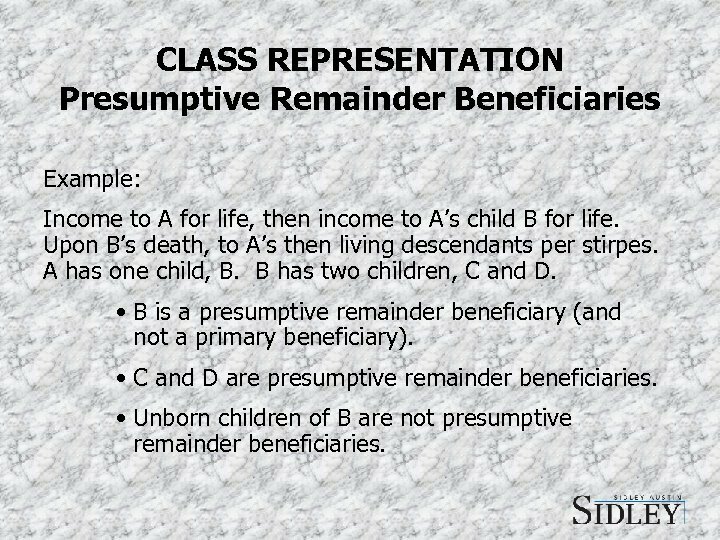 CLASS REPRESENTATION Presumptive Remainder Beneficiaries Example: Income to A for life, then income to A’s child B for life. Upon B’s death, to A’s then living descendants per stirpes. A has one child, B. B has two children, C and D. • B is a presumptive remainder beneficiary (and not a primary beneficiary). • C and D are presumptive remainder beneficiaries. • Unborn children of B are not presumptive remainder beneficiaries. CLASS REPRESENTATION Presumptive Remainder Beneficiaries If all presumptive remainder beneficiaries either are adults and not disabled, or are represented, the actions of such presumptive remainder beneficiaries shall represent and bind all other beneficiaries who have a successor, contingent, or other future interest in the trust. 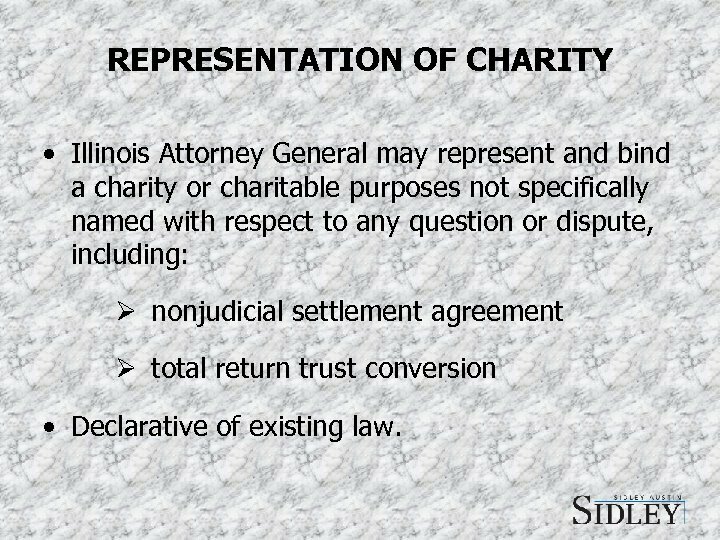 REPRESENTATION OF CHARITY • Illinois Attorney General may represent and bind a charity or charitable purposes not specifically named with respect to any question or dispute, including: nonjudicial settlement agreement total return trust conversion • Declarative of existing law. 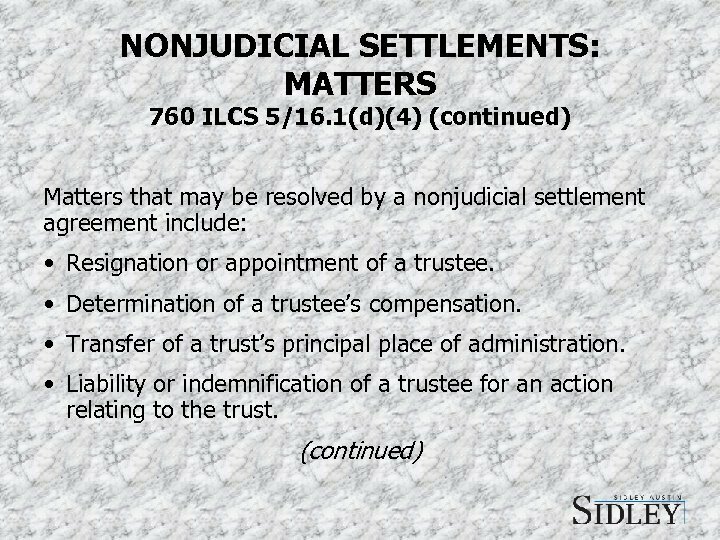 NONJUDICIAL SETTLEMENT AGREEMENTS OLD LAW: • The trustee and all primary beneficiaries of a trust could enter into a written agreement. 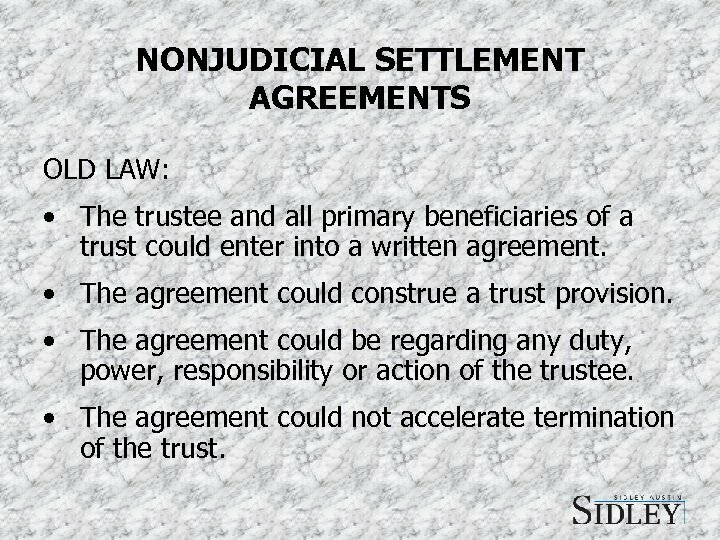 • The agreement could construe a trust provision. 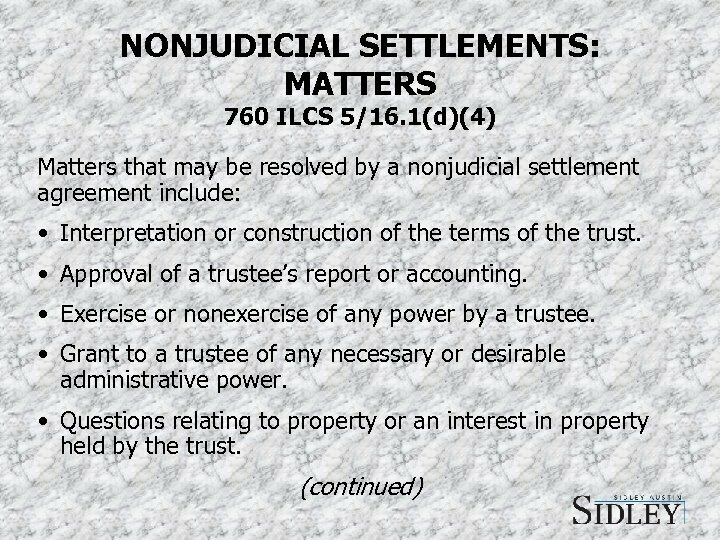 • The agreement could be regarding any duty, power, responsibility or action of the trustee. • The agreement could not accelerate termination of the trust. 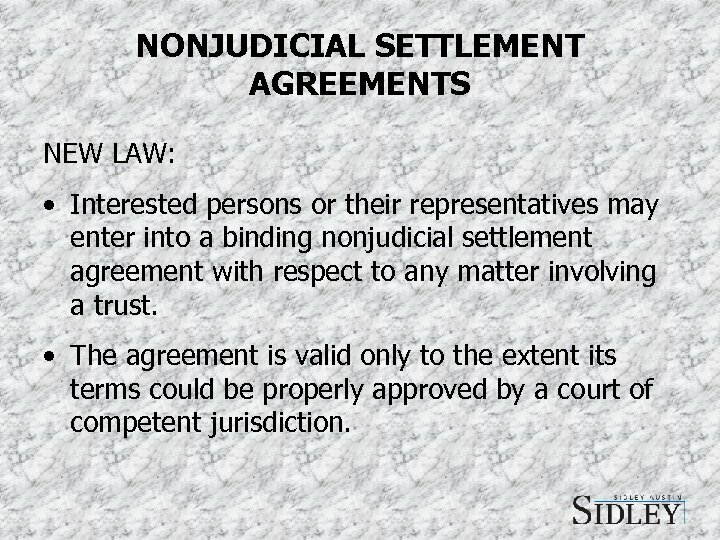 NONJUDICIAL SETTLEMENT AGREEMENTS NEW LAW: • Interested persons or their representatives may enter into a binding nonjudicial settlement agreement with respect to any matter involving a trust. • The agreement is valid only to the extent its terms could be properly approved by a court of competent jurisdiction. 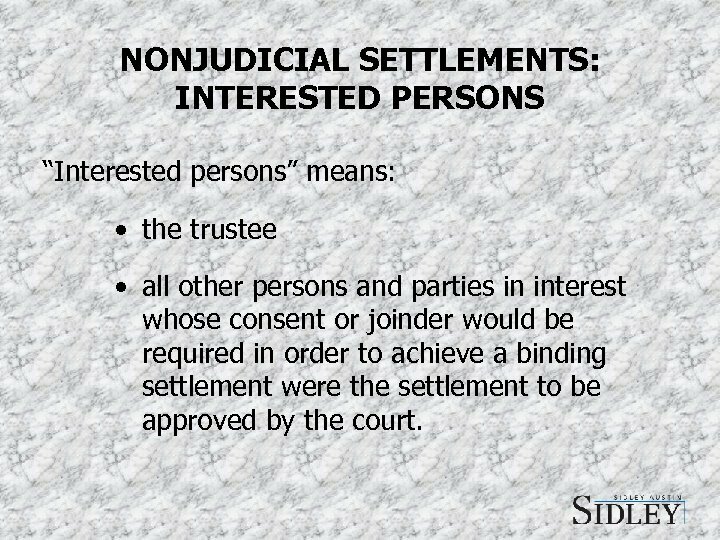 NONJUDICIAL SETTLEMENTS: INTERESTED PERSONS “Interested persons” means: • the trustee • all other persons and parties in interest whose consent or joinder would be required in order to achieve a binding settlement were the settlement to be approved by the court. 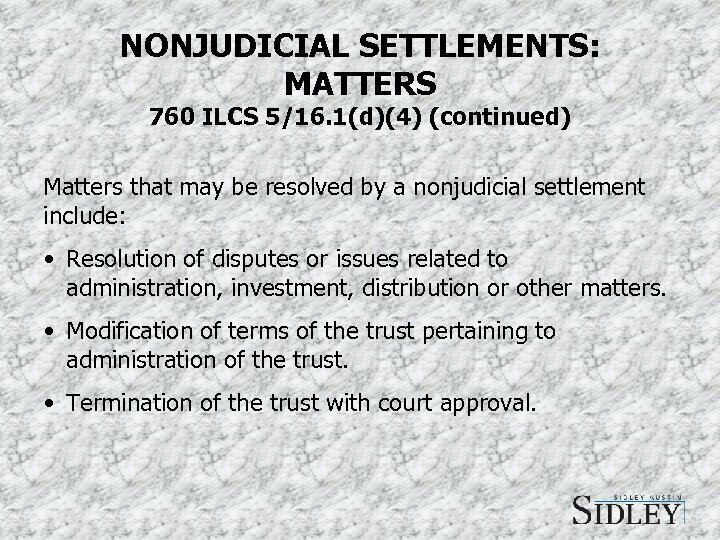 NONJUDICIAL SETTLEMENTS: MATTERS 760 ILCS 5/16. 1(d)(4) (continued) Matters that may be resolved by a nonjudicial settlement include: • Resolution of disputes or issues related to administration, investment, distribution or other matters. • Modification of terms of the trust pertaining to administration of the trust. 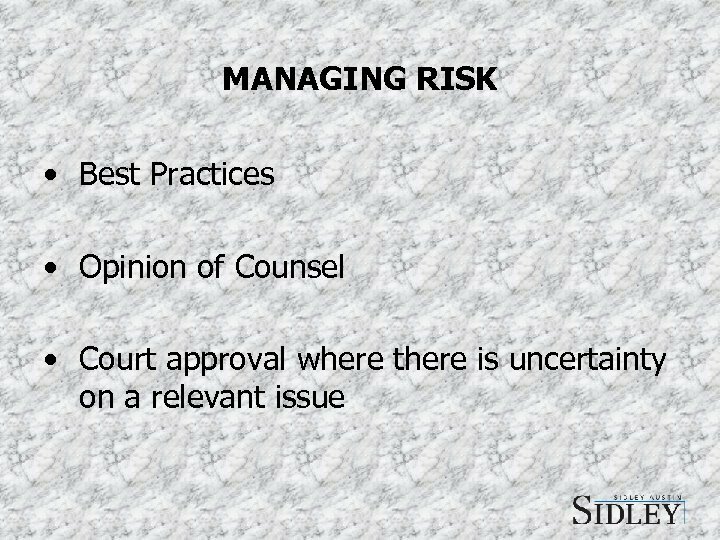 • Termination of the trust with court approval. 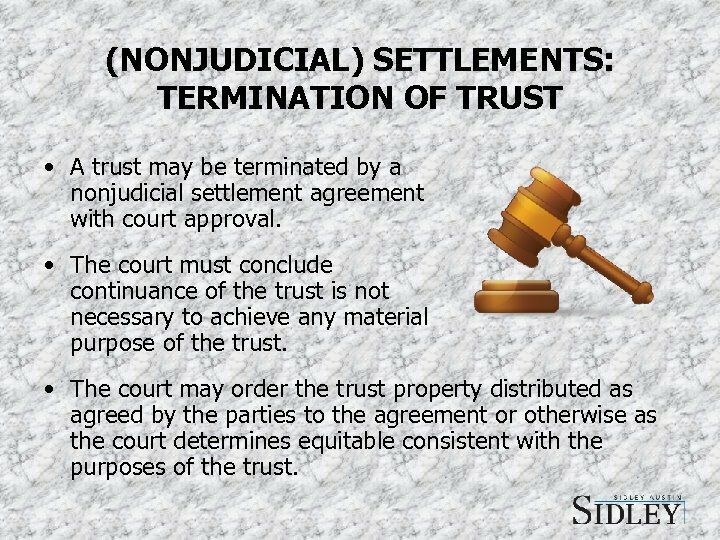 (NONJUDICIAL) SETTLEMENTS: TERMINATION OF TRUST • A trust may be terminated by a nonjudicial settlement agreement with court approval. • The court must conclude continuance of the trust is not necessary to achieve any material purpose of the trust. 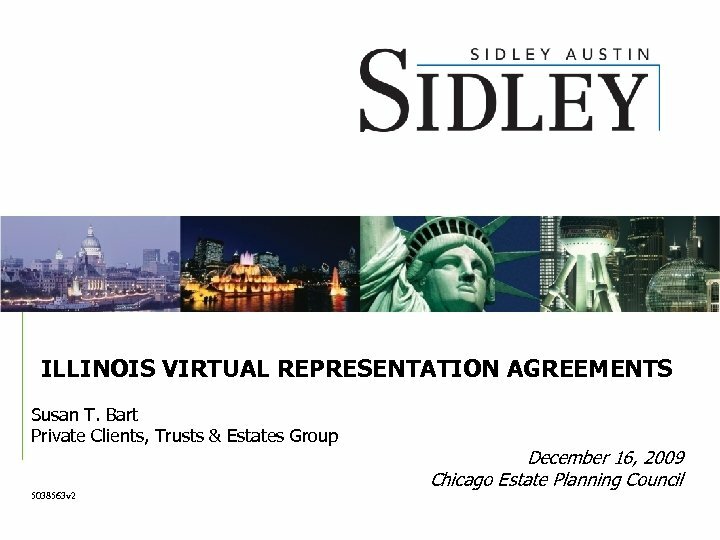 • The court may order the trust property distributed as agreed by the parties to the agreement or otherwise as the court determines equitable consistent with the purposes of the trust. 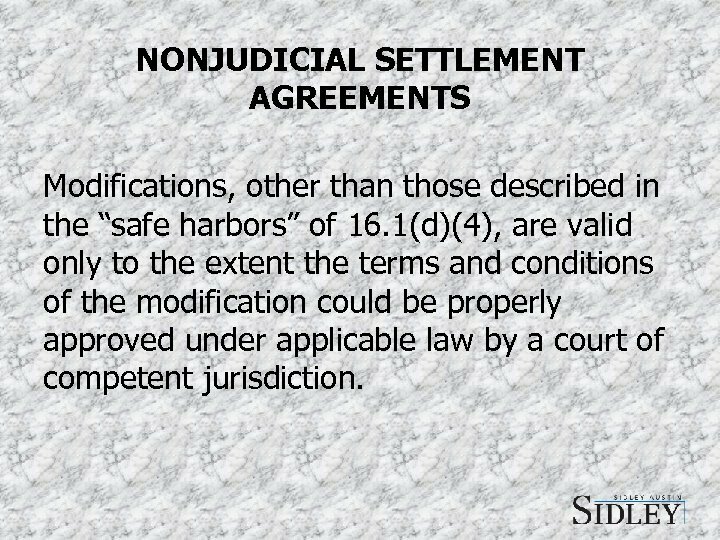 NONJUDICIAL SETTLEMENT AGREEMENTS Modifications, other than those described in the “safe harbors” of 16. 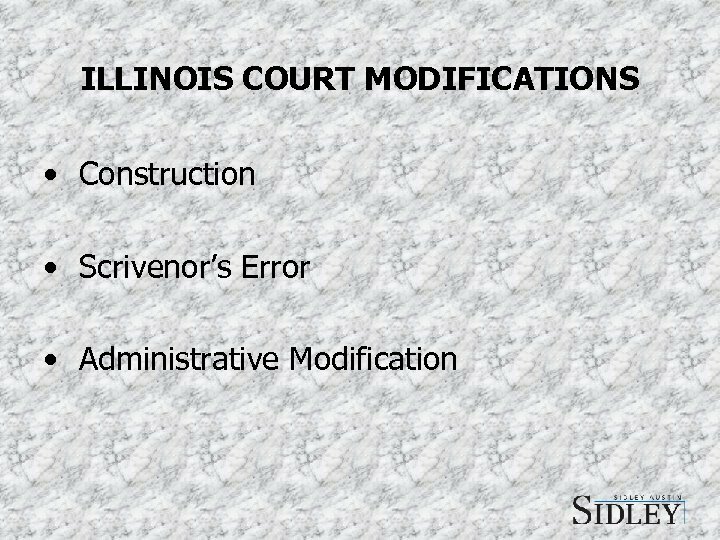 1(d)(4), are valid only to the extent the terms and conditions of the modification could be properly approved under applicable law by a court of competent jurisdiction. 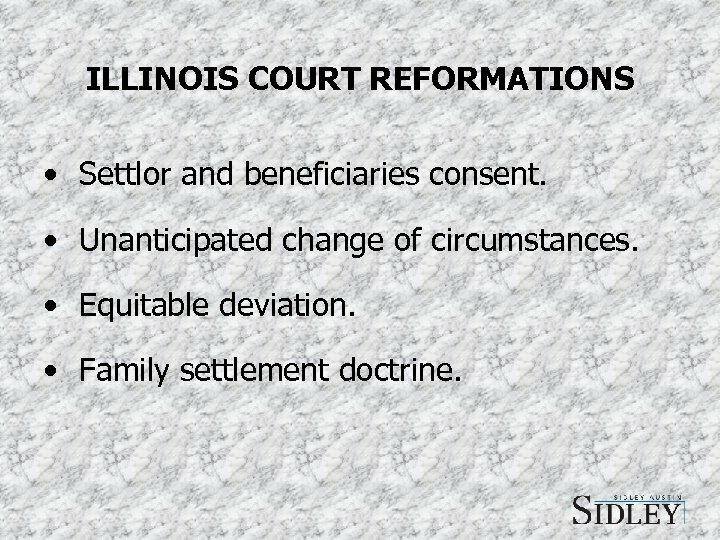 ILLINOIS COURT REFORMATIONS • Settlor and beneficiaries consent. • Unanticipated change of circumstances. • Equitable deviation. • Family settlement doctrine.